Trees that grow along a streamside can often fall into a watercourse due to floods, erosion, windthrow, disease, beaver activity, or natural mortality. These materials, often referred to as Large Woody Debris (LWD), can include whole trees with a rootwad and limbs attached or portions of tress with or without rootwads or limbs. Landowners, municipal public works crews, and others often remove LWD as part of a flood cleanup, erosion control, or stream improvement project. 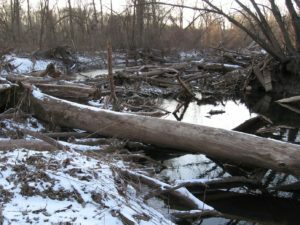 LWD removal should only be considered when there is compelling evidence that it is causing flooding of private/public infrastructure, significant streambank erosion, or is a navigational hazard. A permit from DEP may be required for LWD removal. Where LWD absolutely has to be cut, wood can be floated, repositioned and anchored to the shoreline, so its ecological benefits are not lost. 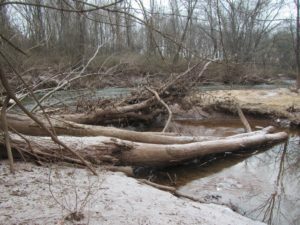 The York County Conservation District’s Large Woody Debris Removal Program offers financial and technical assistance to private/public landowners and managers for the purpose of LWD removal and to address streambank and channel erosion, through local watershed-based planning, restoration, and protection efforts. Assistance is available on a first come, first serve basis, as long as time and resources allow. Projects that reduce pollutant loads and result in measurable water quality enhancements in watersheds where streams are known to be impaired. Projects that result in measurable environmental and water quality enhancements intended to help meet the goals of the Chesapeake Bay TMDL. Projects that protect EV and High Quality Cold Water Fisheries and other pristine streams. 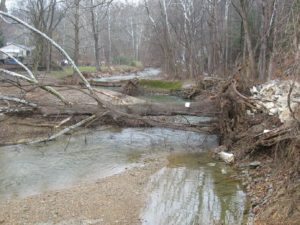 For more information about Large Woody Debris Removal assistance, contact Gary R. Peacock, Watershed Specialist, at 717-840-7687 or e-mail gpeacock@yorkccd.org.